@saaron had asked what in the hell i was doing to Frogger and I realized I should probably update this thread. I limped frogger along for most of 2017 until it finally died at the very end of the driving season. I'd loaned it out to my good friend Baly whose parents were frogger's previous owners. As a kid her dad often took her on day trips in the car and she wanted to take him out for an adventure. Luckily Frogger did great...until she dropped her dad off and stopped for gas. The alternator light came on and it wasn't the regulator wire wiggling loose. We were able to get the car back to the Nameless Barn (optima yellow top FTW) and it sat for a few weeks. When i came back to try to diagnose further i found that the starter motor didn't want to engage anymore. I'd decided that this was a sign and it was time to actually give frogger the attention it deserved rather than one bandaid fix after another. The plan had always been to finish the 67 1600 first, then start working on Frogger, so it sat for most of 2018. Then i started thinking about priorities and what I wanted out of life and the answer always came out to fewer cars and more time. 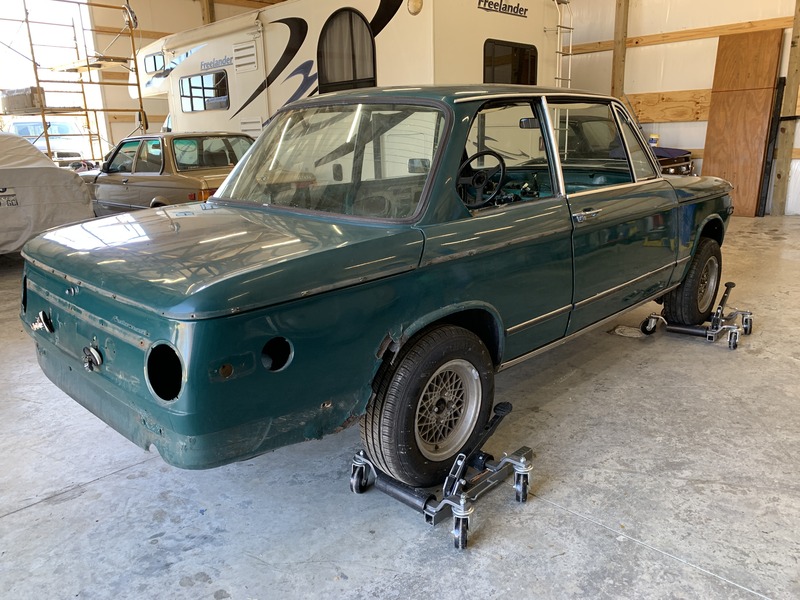 Despite my love for the 67 and all its incredible details, the staggering amount of cash I'd already spent on it, and the fact its in every way a better candidate for a build, I decided to try and sell the 67 and focus completely on Frogger. What. Am. I. Doing. With. My. Life. The more I pull off of frogger, the dumber I feel. This is real stupid. 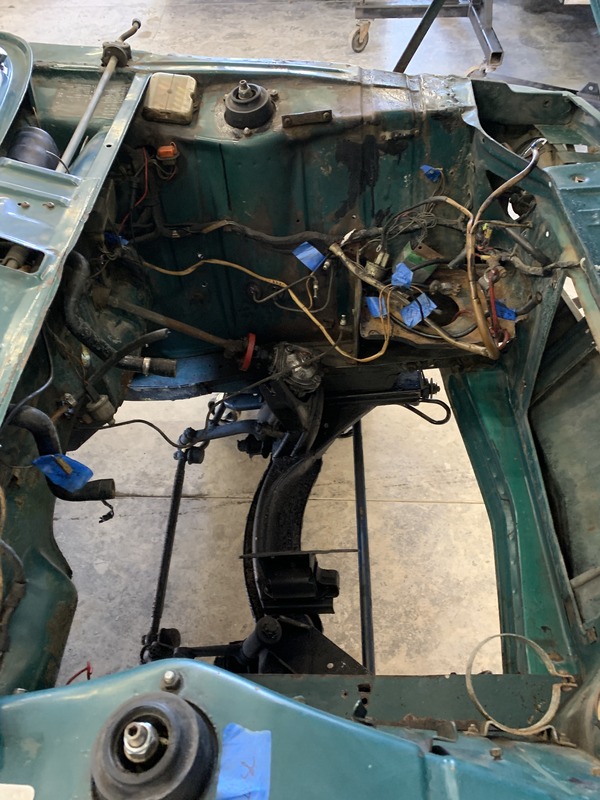 @thehackmechanic once wrote, and i'm paraphrasing, "don't restore cars ya dummy". 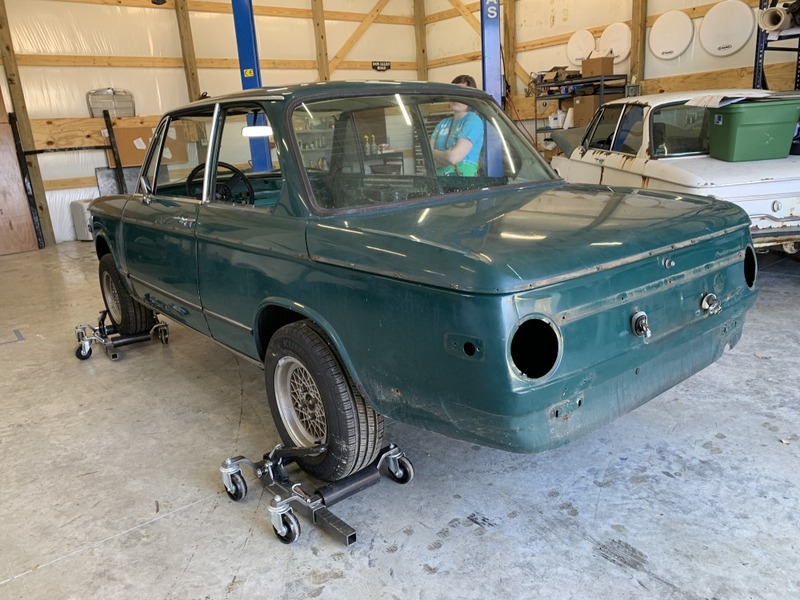 So far i've gotten a good chunk of the way thru restoring one car, decided to abandon that project, and started restoring a worse car. King dummy, at your service. So, what's the plan? 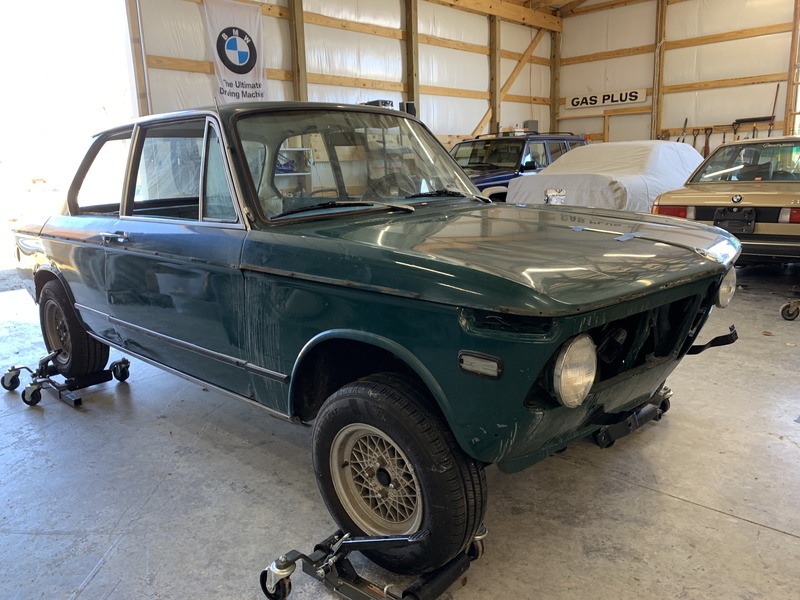 This won't be as involved as a 'full' restoration, or at least i keep trying to tell myself that. 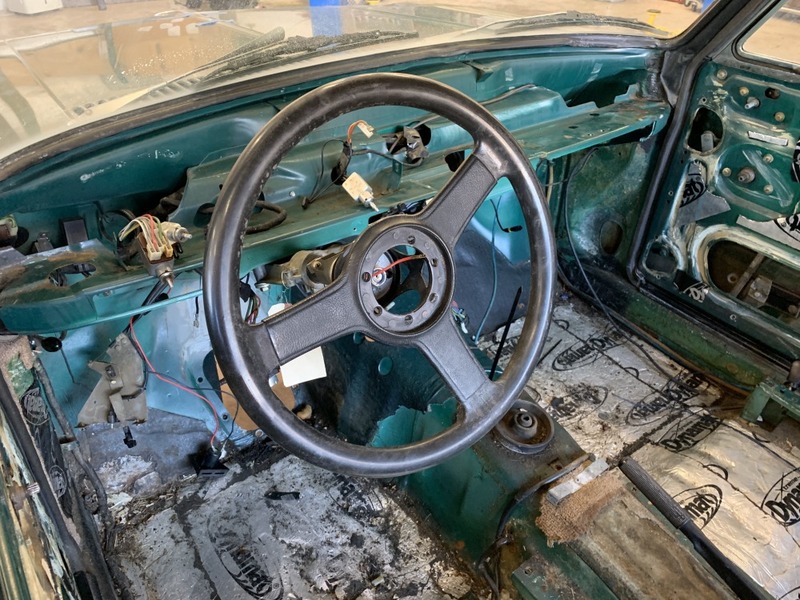 I want all the rust fixed, all the grease and grime gone, working mechanicals, and something that is just nice enough to look at, but not so nice i don't want to drive it to the grocery store. The above photo was after sitting in the same spot for 4-6 weeks or so. Both ATF & Motor Oil. Oof. So, we got to work. 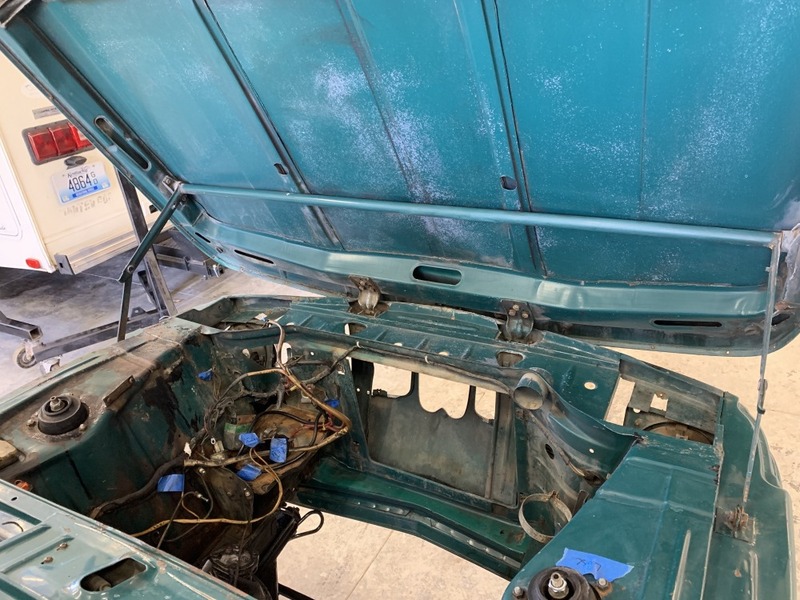 When I say we I'm also referring to my good friend Baly - She volunteered to help with the tear down which means a lot to me because A) hanging out with your friends is what this is all about, I think family connections to cars are cool and am glad she's interested. She also wanted to learn more about old cars and has been all about diving right in. I am a bad mechanic, but have learned what little I know from a lot of really gracious and patient people. I'm glad that I can pass on some knowledge too. The car has been repainted, but i don't think this automatic emblem has ever been off the car. Safety first. The barn was extra humid last year and frogger had some dormant spores left over. Luckily none of the other cars were affected, unluckily everything in frogger was pretty fuzzy. When prepping to drop the drivetrain i found this wonderful bit of hillbilly engineering. The shift rod was held to the linkage by a series of tiny zip ties. Incredible. Click for a Timelapse/Video of the engine coming out of the car - couldn't upload via the native media on the FAQ. We've continued to take more stuff off the car - especially more than I originally expected. 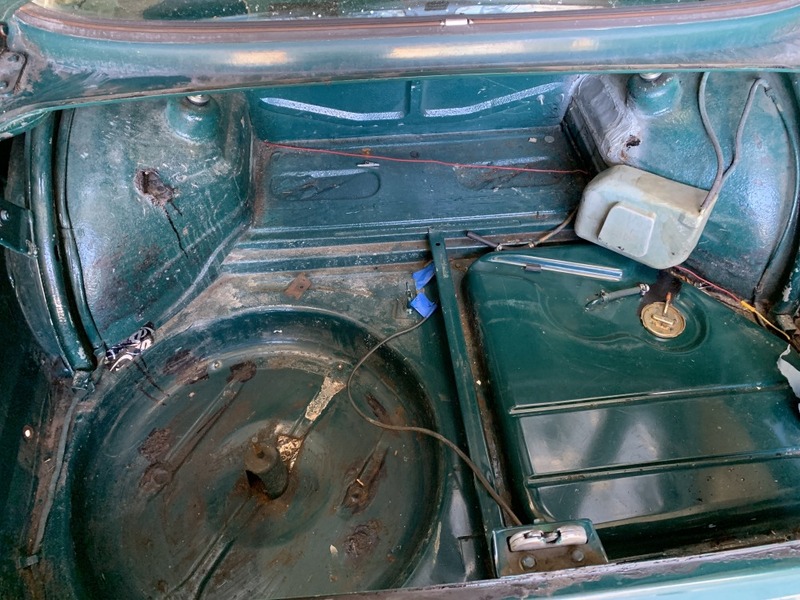 I wanted to leave most of what was in the engine bay alone (ex pedal box, brake hydraulic system etc), but it seems like the right thing to do by actually cleaning and painting everything we can reasonably get to. 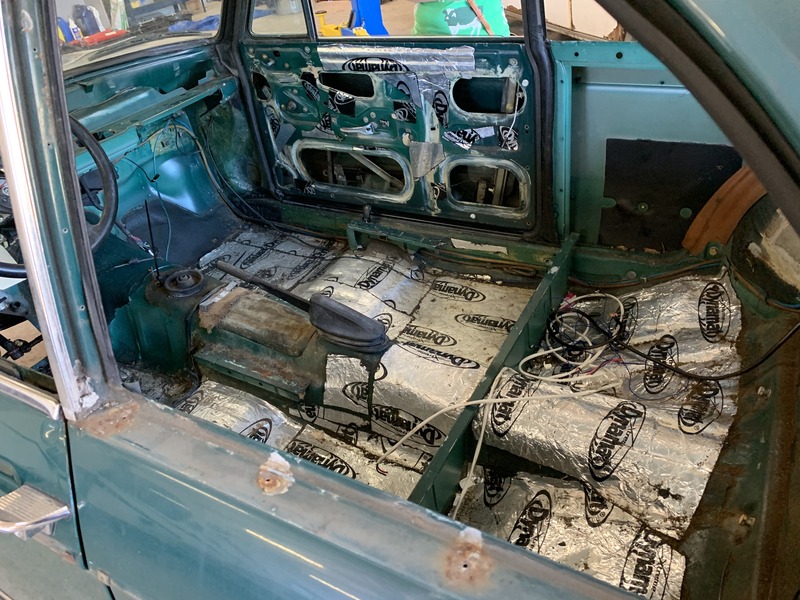 No soda blasting for this car, but the rotisserie is coming out. Yeah, the rotisserie. Things just got a whole lot more serious than I'd ever intended. This is NOT a concourse restoration. This is NOT a concourse restoration. Don't restore cars ya dummy. What was that about a concourse restoration? 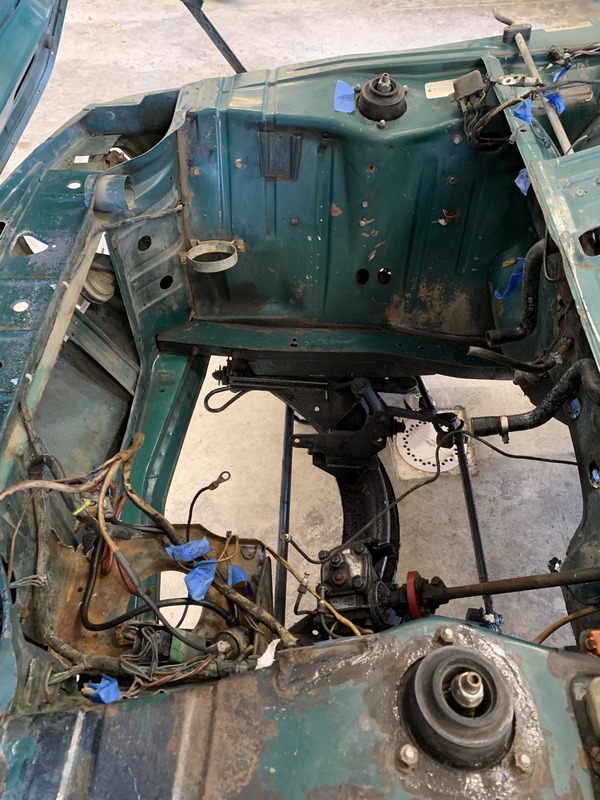 Well, the car may or may not make it on the rotisserie. I just got assigned a 6 week work trip and have run out of time to prep the car. 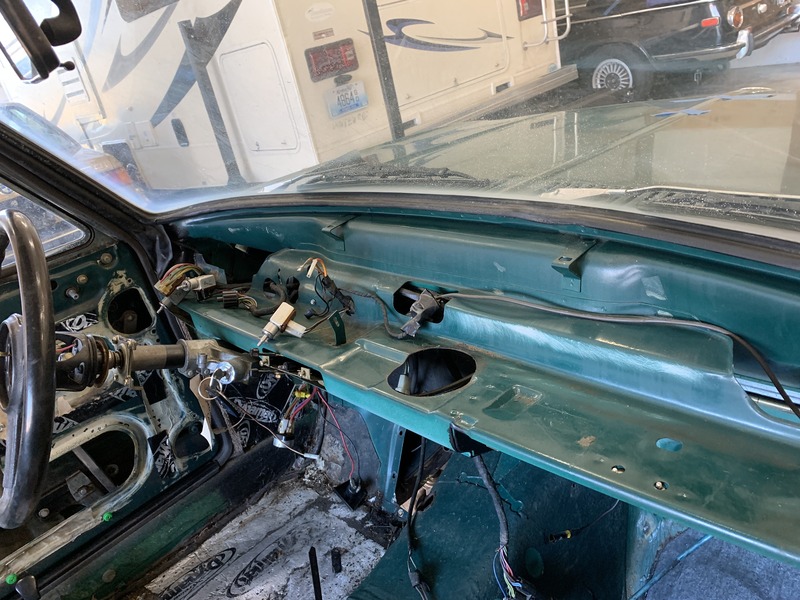 Before I left I threw the steering column back in and I’m going to try and send it to the body shop as is so they can make progress while I’m gone. Not what I wanted to do, but probably the right thing to help limit some scope creep. I went thru with a paint pen and marked some of the less obvious trouble spots and holes that needed to be filled. I’m planning on deleting the front and rear side reflectors, closing the “aftermarket” holes in the hat tray and dash. Considering keeping the knee trim - I kinda think it looks good with the early long rear bumper.